"Let me start by saying that if I could, I would write a recommendation for every book in this series. They're fantastic and every kid needs to read them, and they don't need to be read in any particular order. But, if forced, I would have to pick Crush as my favorite. This is not your typical "first middle school crush" sort of narrative. Problematic aspects of many kids books are left at the door (AKA no mean cheerleaders or exclusive cliques). Our protagonist is a jock who stops bullying whenever he sees it and respects the boundaries of the girl he has a crush on. This book takes a subtle but effective stab at problems of masculinity, sexism, bullying, active listening, and friendship. 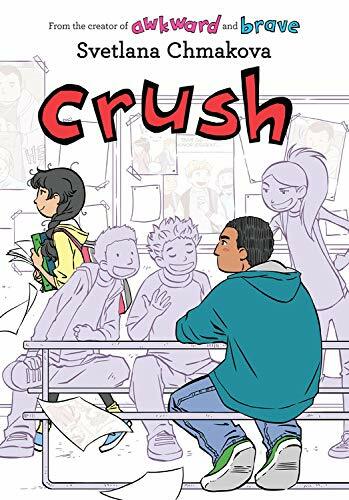 With a diverse cast and a non-preachy writing style, Crush is at its core simply a good story, as every book should be." Section Children's Graphic Novels / All Staff Suggestions / Fiction Suggestions / Audrey S.